The mandate of Paris' annual dance festival, Les Étés de la Danse, is “[to] offer… to French and foreign audiences an appointment with the largest dance companies worldwide”. This summer’s guest company was the incomparable Alvin Ailey American Dance Theatre. Since dancer Alvin Ailey created his own company in 1958, it has become one of the most prolific modern dance companies in the world, “[going] on to perform for an estimated 25 million people at theaters in 48 states and 71 countries on six continents”. When I saw the billboards for their show in the metro and around Paris, I knew dance audiences in Paris were in for a very special treat. AAADT graced the stage at Paris’ Théâtre Châtelet from July 7 to August 1. Throughout the past month, audiences were treated to a different performance each night, culled from the company’s rich repertoire of Ailey classics and guest commissioned choreography. I was lucky enough to witness one of these performances of four stunning and diverse pieces and with my friend Sheila as my date, it was a terrific way to spend a hot July evening in Paris. This was the Paris premier of choreographer Ronald K. Brown’s piece. Dynamic and fast-paced, the dancer’s didn’t stop moving for the entire 24 minute-length of this opening piece. The choreography was inspired by traditional African dance, as well as the beautiful head wraps and flowing dresses of the costume design. The dancers’ knees were soft and the only time they stood up straight was for a split-second before the lights cut to blackout. Even the jumps were incredibly grounded - they traveled more horizontally than vertically, which increased their power and impressiveness. This piece was an effective introduction to the company’s diverse style and talented dancers. Christopher Wheeldon’s stunning pas de deux was another Paris premier by AAADT, beautifully danced by Akua Noni Parker and Jamar Roberts. It was a blend of strength, vulnerability and grace; the haunting piano score by Arvo Pärt and the dancer’s fluid and controlled extensions brought a hush over the audience. The lifts were effortlessly executed, as was the simple and precise contemporary ballet technique. It was a gorgeous piece of dance and a thrill to see Wheeldon’s work live. Act Two premiered Ulysses Dove’s 1984 piece of powerhouse modern dance. It was sharp and commanding, “merg[ing] the influences of [Dove’s] choreographic mentors, Alvin Ailey and Merce Cunningham”. Through three different male-female duets and one male solo, it explored feelings of tension, confrontation, and “emotional passion”. It was modern dance at its most athletic and physically demanding. The lifts were intricate and showcased the strength of both partners, especially when they sometimes turned into tosses. The industrial, pop-flavoured score by Laurie Anderson and Peter Gabriel was a new and welcome direction for the show to take and once again highlighted the company’s exciting stylistic range. Rennie Harris’ Home brought a satisfying conclusion to an arc that began with the traditionally-inspired Four Corners and finished in a modern, urban, hip-hop world. The dancers were tough and bold, breaking away from unison and conformity by wearing everyday street-clothes and by putting their own individual stamps on the movement. There was a rawness and an intensity to this piece that was different than Bad Blood. It could be felt through the crisp isolations, head movements, “intricate footwork and rapidly-evolving patterns”, as well as through the “pulsing gospel house music score by Dennis Ferrer and Raphael Xavier”. Home was my favorite piece of the evening because the dancers felt so loose and free. It was hard not to groove along with them from my seat and it was great to end the evening on a courageous, hip-hop note. I feel so fortunate to have seen this amazing company perform live at Théâtre Châtelet. Though the beautiful old theatre offered little relief from the outside summer heat, it was a great venue to showcase a talented company to a very excited and appreciative audience. 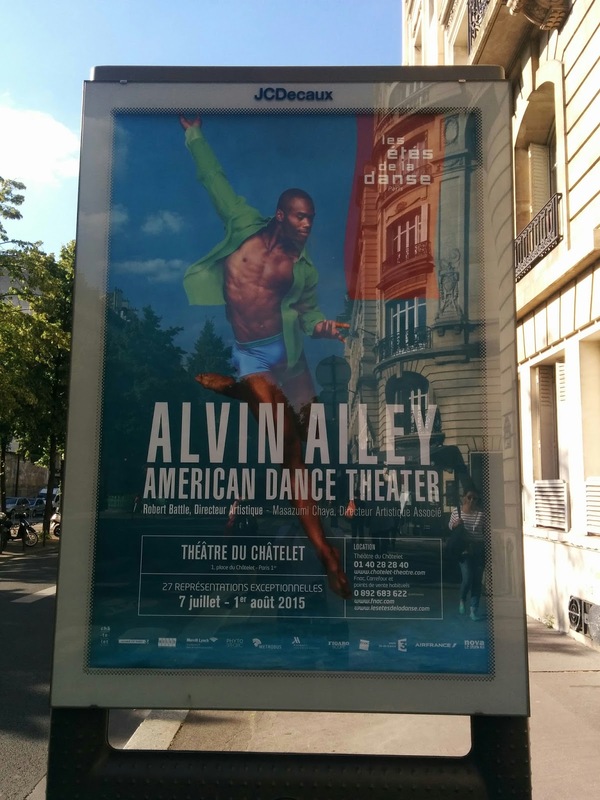 The next stop of Alvin Ailey American Dance Theatre's international tour is South Africa and I have no doubt they will be as warmly welcomed there as they were here in Paris.